Margaret Hall Lassiter, died Tuesday February, 5, 2019. She was 77. A native of Northampton County, Margaret was the daughter of the late Grover Hall and Helen Jones Hall. In addition to her parents, she was also preceded in death by two brothers; Eddie “Lee” Hall and Henry “Pete” Hall, and a sister; Jane Rook. A loving wife, mother, grandmother and friend, Margaret was a retired homemaker and accomplished seamstress. She was an active and Charter Member of Lakeview Park Baptist Church, now Victory Baptist and was known for her boldness in sharing the Gospel with others. Margaret is survived by her loving Husband of 62 years; Johnnie W. Lassiter, daughters; Donna Arp of Winterville and Kim Dickens and her husband Craig of Roanoke Rapids, brother; Richard Hall of Gaston, grandchildren; Jonathan Arp and his wife Lauren, Bryan Arp and his wife Paige, Kendall Rightmyer and her husband Ben, Kyle Dickens and his wife Ashley, great grandchildren; Haley Arp, Hunter Arp, Bryce Arp, Kade Rightmyer, Beck Rightmyer, and Ace Dickens. Funeral Services will be held Saturday, February 9, 2019, at 11:00 A.M. at Victory Baptist Church with Pastor Jeremy Kobernat officiating. Burial will follow at Crestview Memorial Cemetery. 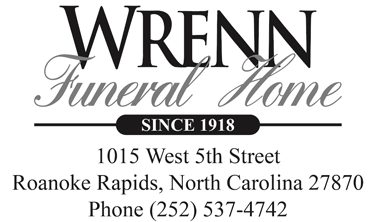 The family will receive friends Friday, February 8, 2019, at Wrenn Clarke and Hagan Funeral and Cremation Service from 6:30 P.M. until 8:30 P.M. The family will also receive friends at the home of Craig and Kim Dickens at 117 Haywood Drive Roanoke Rapids NC 27870. Memorials may be made to Victory Baptist Church Building Fund, 2360 Bolling Road, Roanoke Rapids, NC 27870. Online condolences may be left at wrennclarkehagan.com.